Waterproof canvas covers for industrial equipment and construction are designed, fabricated and installed by American Canvas & Awning. We offer custom design and quick turnaround for special construction covers, tarps and custom painters’ drop cloths. We can advise on fabric selection, installation options, manufacturing considerations and budget. When you protect your equipment, you protect your investment. Call American Canvas & Awning for practical recommendations based on generations of experience in creating custom protection solutions. This photo and more history at sfCityGuides.org. For more on the preservation of the Emporium Dome during construction of the Westfield Shopping center, see this SFgate.com article. 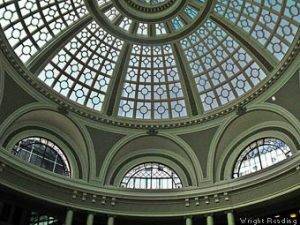 American Canvas & Awning designed and installed a custom protective cover for the historic Emporium dome in downtown San Francisco. The 500,000-pound dome is three stories tall and 102 feet wide, with the ribbing of steel and sheet metal cloaked in ornamental plaster. The original Emporium dome was built in 1904 and survived the 1906 quake but was destroyed in the subsequent firestorm. The dome was rebuilt in 1908 and was a grand fixture atop the old Emporium department store for decades. 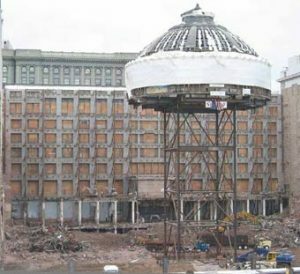 This dome was to be preserved and incorporated into the 2004 construction of the new Westfield Shopping Center at the original site of the Emporium. Before construction, the original dome was lifted hydraulically and set upon a steel tower. The two-year building construction proceeded around the dome while it was in place. This photo shows the dome before we started. There was a previous unsuccessful attempt to protect it with thin plastic sheeting. Notice the sides are still intact but the top is shredded to ribbons. Installation of the historic dome cover required using a crane to lift the crew to the top, working as early in the day as possible to avoid the afternoon wind. Steel cables were attached to the structure at the top and base of the dome. The covers were manually lifted to the top of the dome, one section at a time, laced to the top cable then rolled down to lace to the lower cable. When all four sections were installed and laced to the circumference, the crew laced together the sections covering the curved portion by rappelling down from the top to stretch the cover to its final, waterproof tightness. Then the side panels were installed on the lower cable, laced together, and secured at the bottom. A flap was designed into the dome sections to overlap the side panels for water tightness. The dome was well protected during construction and now stands proudly at the top of the Westfield Shopping Center. Shade and weather protection are important in large industrial areas, such as storage areas and loading docks. 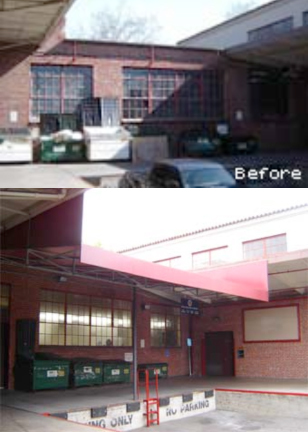 A creative cantilevered canopy design keeps this large Berkeley loading dock cool and dry. This Berkeley building has a U-shaped loading dock that faces west so it receives the full brunt of winter storms, often driving the rain into the door of the warehouse. In summer, the afternoon sun in the West bakes the windows and doors. American Canvas solved both problems with an 800 square foot canopy that attaches to the roof on three sides and is supported by a cantilevered support post installed at the center, near the front. The canopy is high enough for semi-trucks to back under, enabling them to unload in a cool and dry work space. A vinyl-coated awning/tarp material was used for this 36' wide canopy with a 22' projection. Window washer scaffolding rigs have a hard life stored on top of buildings. The delicate electronics and components are heavily exposed to damaging weather and UV light. Covers protect all the rig components and reduce maintenance.